Oh Oskar! I'm so sorry. We are lucky that we are too big for the snuggie. Hope you can be free of it soon! Oh Oskar, the humanity – erm, we mean, the pupanity!! We thought we'd rather like this – our humans have those 'slanket' thingies and they're great but we don't like the look of the doggie version AT ALL! We're sorry you had to go through this indignity – we think your Monnie must have had a temporary lapse!! Schnauzer snuggles – JD and Max. Do you think maybe when it's VERY cold….and in the dark of night? Well, maybe you could save it to use as a "white elephant" gift sometime? I hafta say, I like you in blue, though! One must accept gifts with good grace, particularly from family members. You were very stoic to model it. Now put it away in a safe place where your mom will never find it again. that is so cute.. 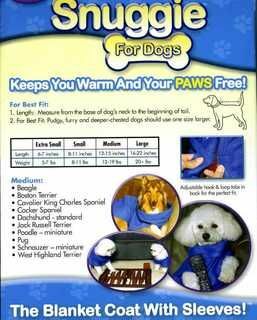 I hope to get one for my dog next winter.. In pink though..
Sure you don't sound very happy about your present! But… I hope you will appreciate it when the winter comes! What wás your Monnie thinking! And what was the manufacturer of this thing thinking! Yesterday I counted 25 hippities sitting on the waterlilly leaves in our pond. You'd love it here. Oh Oskar – that's awful! Best go outside to look for hippities, take your mind off it! PS – I like to chew things to pieces. This is not related to your post at all, I just thought I'd mention it. Thank goodness they don't make them for cats…at least not yet! Thank dawgpaws for the heads-up, Oskar! If we see one of those Hoodies heading our way – we'll be sure to split! Now…..we've heard thru the sniffvine that Mama ordered Cool Coats for us…those wrap thingeys that get soaked in cool water & wrapped around us….in the pretense of keeping "us" cool! Like we're ever gonna see hot weather? We can only hope! Snuggies are much more useful on the Mama where you can just snuggle WHENever you want. Maybe you should accidentally bring it outside when i is raining??? 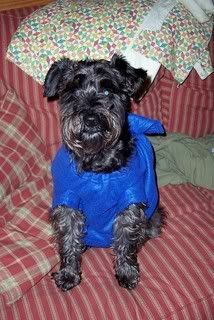 oh Oskar, you are such a good boy and so patient, but I love you in blue, it's fashion and you are great my friend, be happy okay! 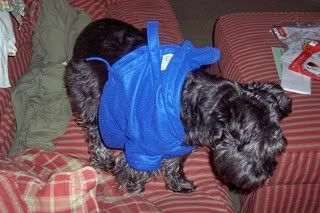 Well I must say that you do look cute in the dreaded snuggie! Oh Oskar! 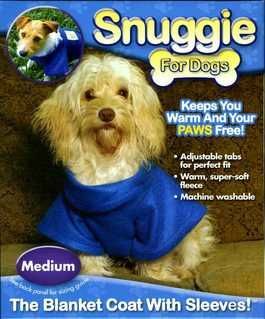 I actually think that looks so lovely and warm – I'd like one, although I doubt they make one big enough for me! Hee! Hee! I like dressing up, but that just doesn't have much fashion appeal to me. Maybe it would be good for one of your camping trips? Snuggling by the fire? I'm sure yer Grammie was thinking of keeping you toasty…so be nice…give her a soft woofie kiss for thanks…then drag it off somewhere and bury it deep! luckily it warm all year round in my country. if not, i guess my mummy would have got one of these too.